All participants arrived in excellent spirits and in excellent shape. 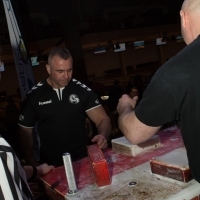 On November 18 David Bartosiewicz - Eduardo Tiete and Tim Bresnan - Gennady Kvikvinia will pull. Join the viewing of the most interesting duels on Vendetta All Stars & Zloty Tur!